Most mornings, Bill leaves before the sun rises to fly RC planes and visit with his buddies and Monday was no exception. Leaving Johnny to sleep in, I decided to join him at the R/Sea Hawks Field on Cape Coral. He had seen two Bald Eagles at the park the day before - and I was hoping they would still be in the area. This is what o'dark-thirty looks like at the flying field. 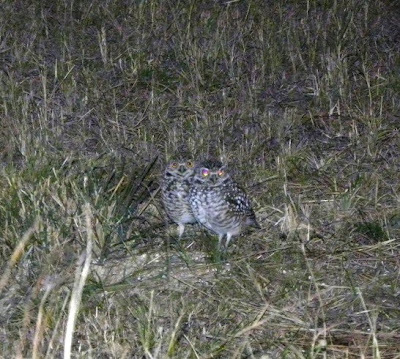 It was too dark to fly so we went around the corner to see if any of the Burrowing Owls were up yet. Bill knew that seeing them would make my day - even if we did not see the eagles. 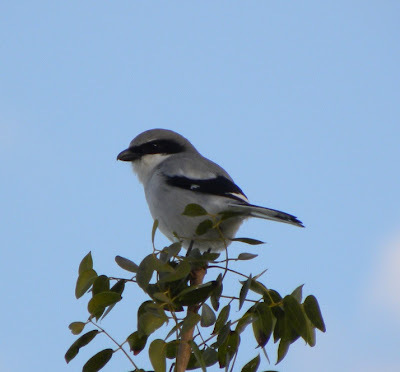 This Loggerhead Shrike was making lots of noise in the Mahogany Tree. 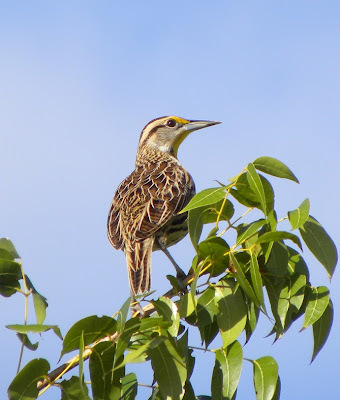 I love listening to the Eastern Meadowlark. His chest is bright yellow with a black "V" necklace - but it is their song that attracts you. Our friends Wendy and Larry joined us later in the morning. They had seen the eagles the day before - and just knew I would be there, hoping to get a picture. The eagles did not appear, but I had a wonderful visit anyway.